Sometimes you get the crab… last night the crab got me. Jenny had invited me over for dinner last night. Her husband had bought a huge box of live crabs and Jenny steamed some of them for dinner. Jenny is Chinese and she made this incredible ginger dipping sauce (recipe included). First of all I hate eating food that still looks like some innocent creature, give me my meat in a ziplock bag please. Here are some detailed instructions on how to eat crab. Step 1 – Find the crab’s face and pull apart the top and bottom shell to open it. Step 2 – Pour ginger sauce into the top shell and mix it with the yellow mustard stuff in the shell (aka – the crab guts). Step 3 – Pull out the lungs from the bottom shell, these are not edible. From there you crack the little pieces of the bottom shell to get the small morsels of meat out of the various crevices in the crab body. Dip each piece in ginger sauce, put the whole thing in your mouth then spit out the shell part. Step 4 – Eat the legs last. Crack the legs open with you teeth and use a chop stick to dig the meat out. (Chop sticks worked surprisingly better than American tools btw). Personally I was too scared of breaking a tooth to crack anything with them, so I tried to break each piece apart with my hands. A couple of the little spiny parts made paper cuts on my fingers and I got a larger cut on my index finger that required a band-aid and lots of antibacterial cream. Mix all ingredients thoroughly and serve. It’s delicious. We will have to try the crab recipe. We used to fix fresh lobster, clams and shrimps when we lived in Massachusetts they are good fresh but a challenge to eat for sure. need lots of butter to dip them in will have to try your recipe for a sauce. You’ve totally got to try this, it was amazing. So much better than plain butter. The trick is to chop the ginger really fine either with a grater or food processor. Tell everyone at church I said hey. I’m thinking about ya’ll. 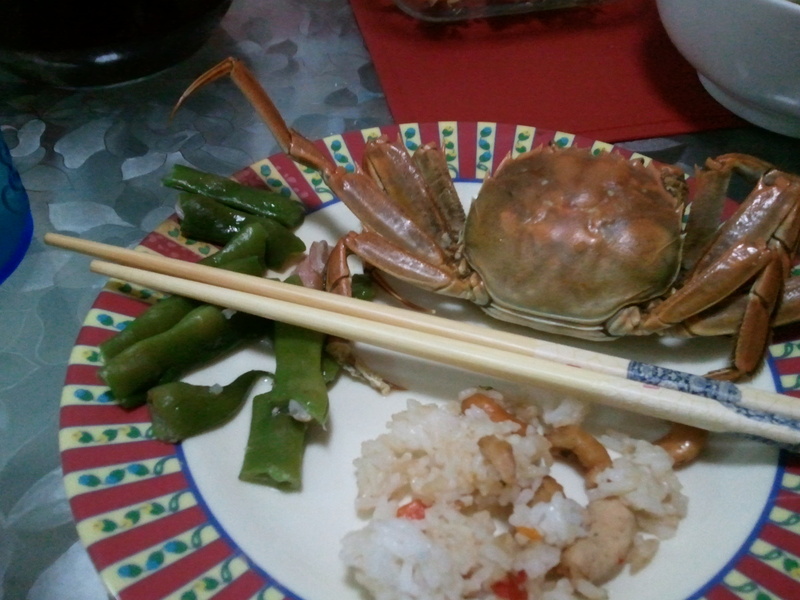 it requires a little skill to eat crabs. but it is a little surprise me that don´t people eat crabs in America? I think it is very normal seafood in America, isn´t it? Looks good, but I’m afraid might be allergic! Lol! Miss you bunches! It was totally delicious. I hope you all are doing okay. How’s everything going with the kids and school and such? I hope Mekenzie is doing well this year, I know she was having a hard time there for a little while. If she’s got an email address let her know she can send me an email sometime. It’s good to hear from you. It is still raining as of last night by the way. I think today it’s finally over and has cooled off to fall weather. I even had to wear a jean jacket yesterday (unusual because it’s been like 95 and humid for the last few weeks). I hope the weather stays cool but you never know. This morning I called my Mom and when she answered I forgot that it’s still Wednesday night there. Ooops. I always know that it’s night time there but it’s hard to remember you all are a day behind, so I can’t call anyone on Monday or Thursday mornings because of church. It’s annoying. Anyhow, it’s good to talk. I miss you all very much. Tell the kids I said hi. That crab looks different than the blue crabs we have in MD. That one has smaller legs and a more rounded body! Are you getting more adept at using chop sticks? i am getting a little better at using chopsticks. LOL. The wooden ones are pretty easy because they grip your food but the metal ones are super hard to use. Honestly I’ve gotten in the bad habit of eating at home alot which means a lot of american foods.